I am a huge fan of horror and have read more than my share of books and watched a ton of movies in the genre since I was a kid. In fact, my earliest memory of a horror movie was of my parents trying in vain to keep me from peeking at the Texas Chainsaw Massacre when I was three years old. To this day, I love all things dark, gory, and twisted but there are certain themes that I really enjoy. Topping off the list would be the crazy sick twisted psycho murdering family and unidentified creepy horrific creatures that you cannot seem to escape at any cost. 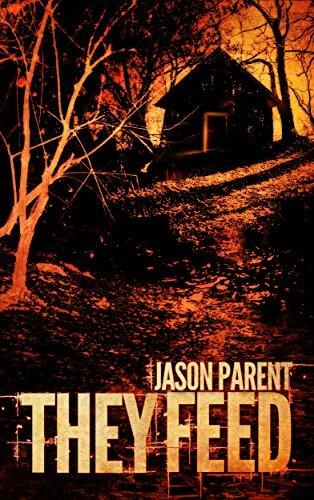 They Feed by Jason Parent takes both concepts to an entirely new level as he weaves a story culminating in what can only be described as an unholy pairing of the two. A fairly easy read, the beginning gives a feel of an old 80s slasher flick, but as the story progresses, this campy slasher feel is replaced by a darker vibe really makes this book hard to put down. With the meat of the action taking place within the span of a night, the pace is fast, and I feel that added an additional measure of urgency to reach the end. Not wanting to give anything away, I will only say that The Feed is a must-read for anyone who likes creepy crawly things that go bump in the night stories, but be forewarned, this one packs one hell of a twist.